I knew today could be a significant severe weather day, but because I had to leave very early to go to Cape Girardeau, MO on business I had no chance all day to look at weather until I got home around 3:00. As I changed clothes I flipped on TWC to see what was happening, and quickly saw that most of NE MO and central and northern IL were under a tornado watch. I waited for the radar and saw a curved line of scattered storms from northeast MO into extreme west central IL and back southward to just west of St. Louis. Of particular note was a strong individual cell northwest of St. Louis. Although we were south of the watch area, the OCMs were constantly talkng about the likelihood of the storms building southward. I knew I had very little time to check weather if I did want to go after any of these storms, but quickly checked the latest SPC convective outlook, which had all of IL and extreme eastern MO in a slight risk. Having no time for any more analysis than that, I began getting my gear together and checked TWC again. The cell I had seen appeared to be strengthening, and I guesstimated I could intercept it somewhere around Carlinville, IL based on its apparent motion if it held together and if I left quickly. After running back in to grab a couple things I forgot, I headed out the door from my home in Edwardsville, IL (about 20 mi. NE of St. Louis) around 3:40 p.m. I drove up I-55 to the Litchfield exit, watching the cell come into view well to my west. About 10 minutes after I left home, the STL NWS office issued a severe t-storm warning for northern Jersey Co. for this cell. Movement was NE at 25, so it shouldn't be too hard to catch up and keep up with. There was also a smaller and weaker but strengthening cell closer to my SW, probably not too far from Edwardsville. By the time I neared Litchfield, the Jersey Co. storm was looking good - anvil being carried off far to the NE, and a hard, vertical tower at the storm's SW edge. 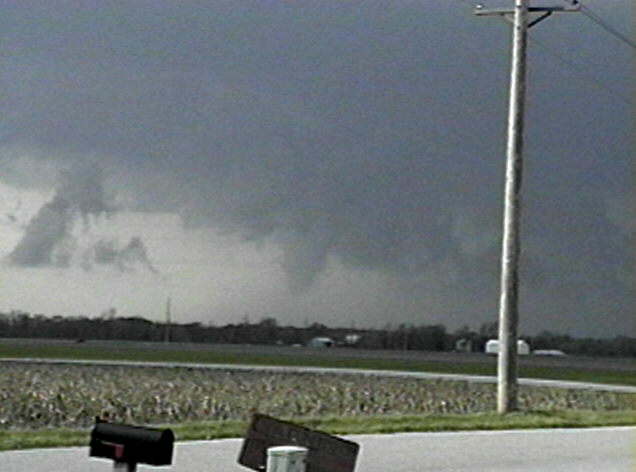 I was a little north and well east of the updraft now, so I turned and headed west on IL route 16. By this time I had lost the STL weather radio station, so I put my AM radio on KMOX. A few miles west of Litchfield route 16 turns SW, but you can continue west by turning onto 1200 N. at Hornsby, which I did. I thought I could take that to route 4 and turn north toward Carlinville. As I got more west I tuned in the weather radio and got the STL station again, and found out that another tornado watch had been issued covering much of the remainder of southern Illinois not covered by the earlier one, including Macoupin Co. where I was located and points east. As I approached route 4 the storm was looking better and better, becoming more backsheared. When I got to hwy. 4, I decided to continue west rather than turning N., since the storm was still a ways to the west, with the updraft just a little farther south than my location. I was still facing bright sun as there was little or no flanking line or any other cloud structure to block it out. When I reached 1600E, which is a curving north-south road almost due S. of Carlinville, I decided to turn north. As I got closer to the storm, I got the first good look at its rain-free base, which contained some small lowerings. I continued north until I found a good place to stop about 4 or 5 miles S. of Carlinville. Going north I lost the weather radio station, so switched back to KMOX. As I got out, I was blasted by inflow from the SE as I stood in awe of the spectacular storm structure before me - classic supercell structure. The anvil was now very backsheared, and towered above me. 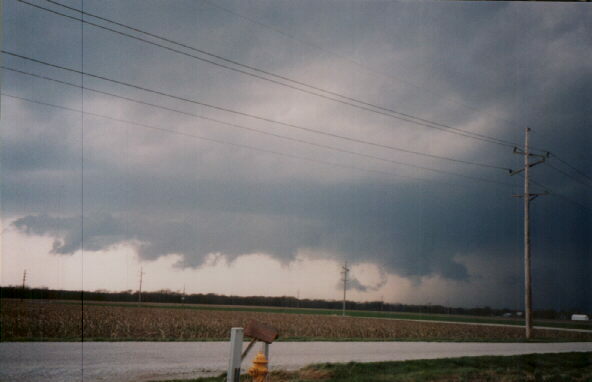 A wide wall cloud formed out of the lowerings under the main updraft, with inflow tails on both ends. CG lighting zapped down in the dense precipitation core to my north. I took photos and started to tape as some interesting lowerings extended from the wall cloud, only to realize after about 5 minutes that my camera was not taping - in my efforts to freeze the focus at the maximum distance, I had frozen the whole camera. I had to turn away from the awesome storm to deal with this bit of technological incompetence on my part, but after a few minutes finally solved the problem. With all the excitement I forgot to check the time, but it had to be around 4:20 or 4:25 when I arrived at that location. I watched, photographed, and videotaped the storm for 20 to 30 minutes. 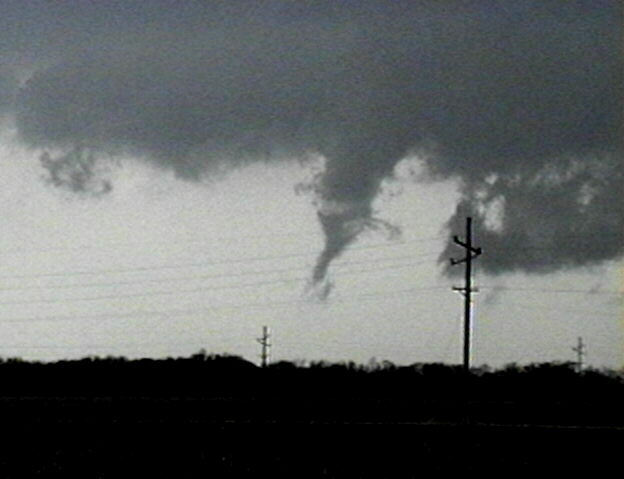 Toward the northern end of the wall cloud, I saw a needle funnel which persisted about 50 seconds. Here is a video snap of this structure just after it appeared, and here is another from about 30 seconds later. Toward the southern end of the wall cloud, some slow rotation became evident at the time of this shot. Toward its northern end, what appeard to be a much larger, wider funnel formed, though it was hard to tell for sure as this structure was slightly rain-wrapped. 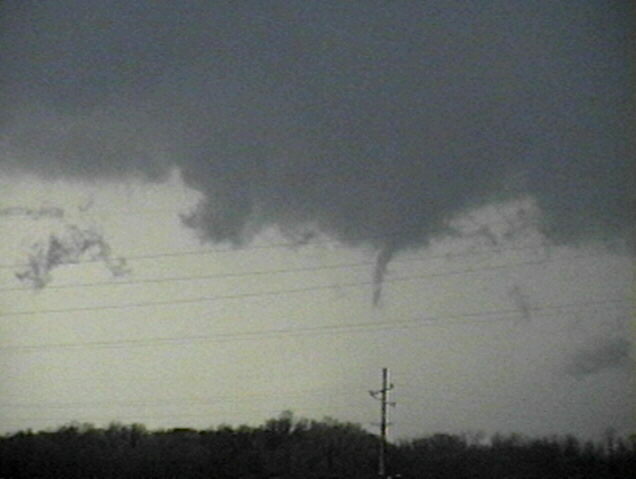 Here is another, more zoomed, video snap of this apparent funnel, with a possible slight RFD notch forming on the left. This lowering reached more than half of the way to the ground. 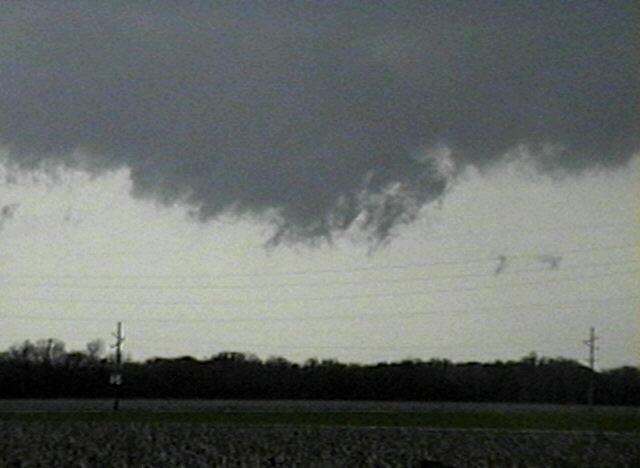 Another narrow lowering formed near the southern end of the wall cloud; it reached almost 2/3 of the way to the ground. 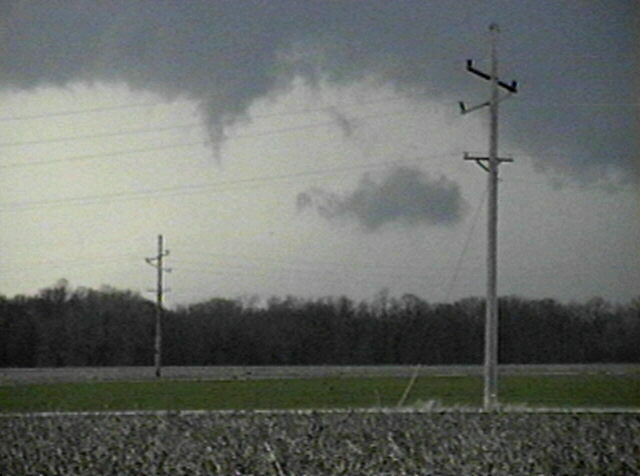 Its shape appeared to be that of a funnel but I could not verify rotation and it did have some discontinuities; after about one minute it appeared to rope out and disappeared. The whole time I watched this storm I was blasted by inflow from the SE that I would estimate at 20-40 mph - it is the main sound you can hear on my video. As more and more of the lowerings lost contrast as the storm got farther NE so the rain area was behind the lowerings, I knew it was time to move northeast. As I got in the car, KMOX was finishing up the process of announcing a tornado warning for Macoupin Co. - my storm! As the warning below indicates, St. Louis NWS had a TVS about 5 miles W. of Carlinville at 4:45 - the approximate location of the apparent large, partially rain- wrapped funnel I had seen. My only way northeast was to proceed into Carlinville and then head east, which I did, on IL route 108. Now the storm had gotten ahead of me and was both north and east of me - it seemed to be moving faster than before, which is confirmed by the NE at 35 movement indicated in the tornado warning. I figured I could head east then catch up with it by heading up I-55, but there was one problem with this - it was now about 5:00 and I was supposed to meet someone in Edwardsville at 5:30. I grabbed my cell phone and cancelled that. 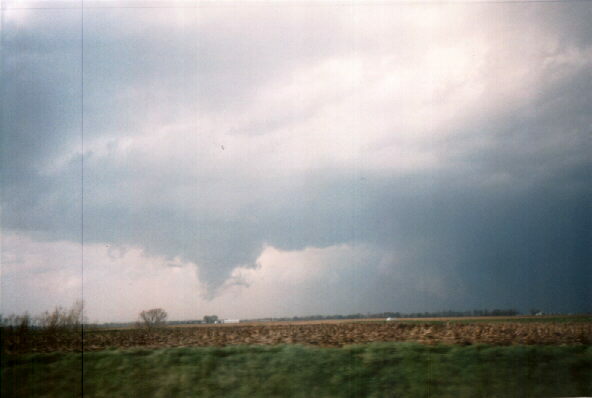 As I headed east, yet another lowering formed under the updraft which was now to my NNE. 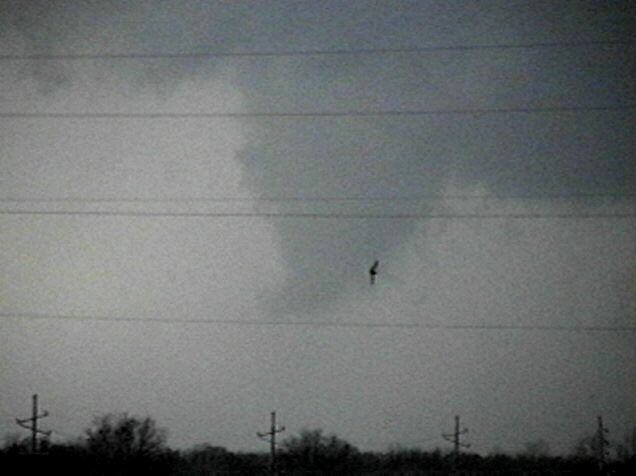 This may have been the most impressive of the day, a narrow lowering that reached 80 percent of the way to the ground. I could not verify rotation, so I would classify it as a "likely funnel" based on its appearance, but cannot say that with 100% certainty. In any case, it was every bit as awesome as it appears in the picture. I did not hear it at the time, but I found out later that, around this time, the Lincoln, IL NWS office issued a tornado warning for Southern Sangamon and northern Christian Co. based on a TVS around this general location. The lowering got shorter but wider, and to its right, too far away to see well, was what appeared to be a front-lit lowering extending almost to the ground. It appears as a lighter colored lowering on the right of the picture. However, given the rapidly increasing distance between me and the storm as it got farther and farther to the north of me, part of the latter formation could have been a sunlit rain or hail shaft. 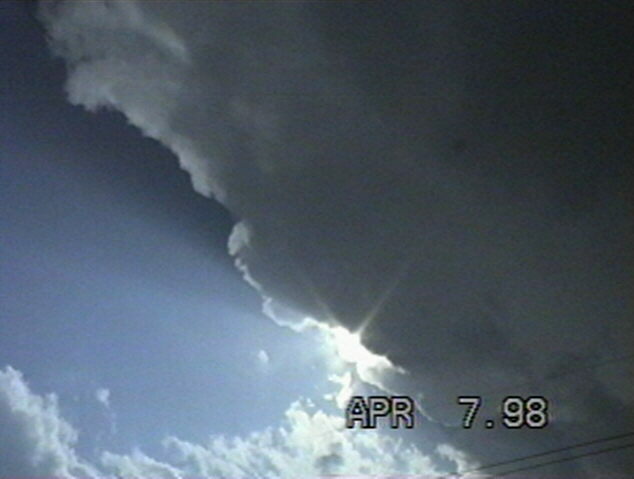 By now, I was in anvil rain from a rapidly intensifying storm to my SSW. Both to avoid getting hailed on by that storm and to try to catch up with the other one, I headed north on I-55. But the storm had too good a lead on me, so I gave up after two exits. By this time all the lowerings had disappeared, but the storm had developed what may have been an RFD notch. But seeing no more lowerings and being well-behind it, I gave up, as I was really needing to get home because of evening commitments. As I headed back, the cell that had been to my SSW had crossed I-55 and was really intensifying. I got some nice pictures of it, and was fairly sure by looking at it that it had gone severe. Sure enough, when I checked the warnings archive later this evening, I found that it had prompted at least 2 tornado warnings. As I headed down I-55 for home, I pased through a couple convective, high-based rainshowers - really big drops spattering down in the second one. The cell to my east and the passing rainshowers resulted in several nice rainbows along the way home. I arrived home around 6:15; total chase distance about 125 miles. TO 80 MPH...AND DANGEROUS LIGHTNING ARE POSSIBLE IN THESE AREAS. MO WILL ENHANCE SEVERE THUNDERSTORM DEVELOPMENT ACROSS SRN IL. GUSTS TO 70 KNOTS. 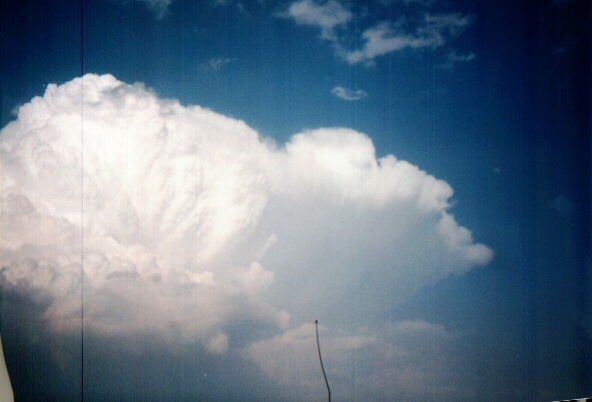 A FEW CUMULONIMBI WITH MAXIMUM TOPS TO 500. MEAN STORM MOTION VECTOR 24035. 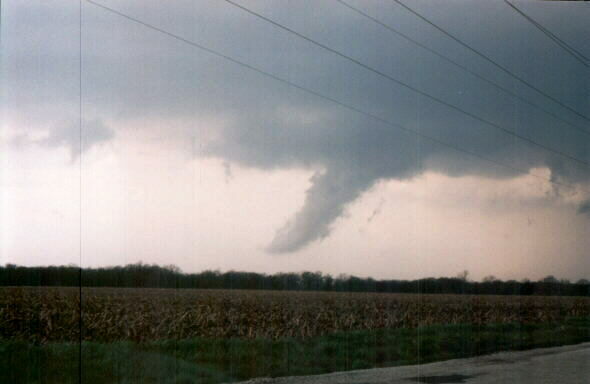 MILES EAST SOUTHEAST OF BLOOMINGTON ILLINOIS. AT 444 PM...RADAR DETECTED A TORNADO 5 MILES WEST OF CARLINVILLE. IT WAS MOVING TO THE NORTHEAST AT 35 MPH. TOWNS IN THE PATH ARE NILWOOD...STANDARD CITY AND GIRARD. THIS IS A DANGEROUS STORM SITUATION. ACT QUICKLY AND SEEK SHELTER NOW!